The European Union and U.S. strike conciliatory tone on trade. 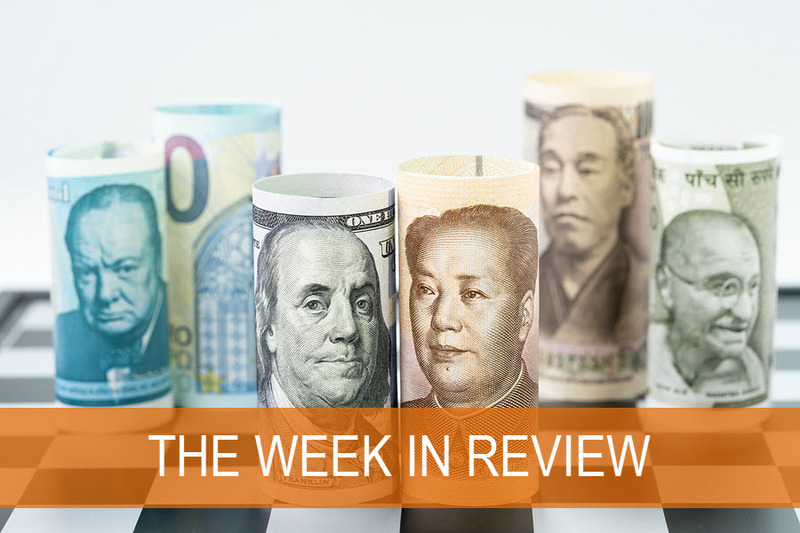 Last week brought some positive developments on Europe-U.S. trade relations and NAFTA negotiations, though trade tensions continue between the U.S. and China. European Commission President Juncker and President Trump met and agreed to ease trade tensions. Europe plans to buy U.S. soybeans and liquefied natural gas if the U.S. decides against imposing new tariffs on Europe automobile exports. NAFTA negotiations could wrap up by the end of the year as the administration of Mexico’s president-elect expressed optimism on working more closely with the U.S. The U.S. and China took steps to hunker down for a drawn-out trade skirmish, with the U.S. offering aid for farmers hurt by tariffs and China moving forward with fiscal stimulus measures. ECB remains on track to wrap up bond purchase program. Last Thursday’s European Central Bank (ECB) meeting was broadly in-line with market expectations, as ECB President Mario Draghi viewed Europe as following a path of broad-based growth despite some uncertainty around global trade. The ECB left its main policy rate unchanged and is expected to stay there at least through the first half of 2019. The bond purchase program of €30 billion per month continues for now and will follow the ECB’s plan to halve the purchases in September before ending them in December. Global flash manufacturing PMI data still expansionary. As measured by flash manufacturing Purchasing Managers’ Index (PMI) data, all major regions remain in expansionary territory (above 50). The U.S. (previous 55.4) and Europe (previous 54.9) ticked up slightly to 55.5 and 55.1, respectively. Also in economic data, the U.S. posted a strong 2Q2018 GDP figure of 4.1% annualized quarterly growth. Wide array of sectors continue with 2Q earnings releases. Various companies are reporting across a number of sectors including Berkshire Hathaway (BRK/B), Procter & Gamble (PG), Caterpillar (CAT), Apple (AAPL) and Pfizer (PFE). BOJ, the Fed and BOE all meet this week. Bank of Japan (BOJ) policy is expected to remain very accommodative in the immediate future, though there were some whispers last week that the BOJ may scale back stimulus to ease strains on Japan’s banking sector. The Federal Reserve (Fed) is not broadly expected to raise rates at its meeting this week, though many investors continue to expect a rate hike in September.9 We believe markets will also be looking for any clues on how the Fed is thinking about the flattening yield curve.10 Finally, the Bank of England (BOE) is widely expected to move its main policy rate up to 0.75%. The meetings take place throughout this week, led by the BOJ (Tuesday), followed by the Fed (Wednesday) and the BOE (Thursday). Surveys expect healthy U.S. jobs report. Labor market data in the U.S. will be released on Friday. Consensus surveys expect 193k jobs to be added, wage growth to remain unchanged at 2.7% y/y and the unemployment rate to tick down to 3.9%. Last month’s increase in the labor force participation rate to 62.9% caused the unemployment rate to move higher. Discouraged workers may be continuing to return to the workforce, which could similarly impact July’s unemployment rate. 1. Bloomberg, MSCI World Index returns 23Jul2018 – 27Jul2018. 2. Bloomberg, MSCI U.S. Equities IMI Index returns 23Jul2018 – 27Jul2018. 3. Bloomberg, MSCI ex-U.S. Equities IMI Index returns 23Jul2018 – 27Jul2018. 4. Bloomberg, MSCI Emerging Market Equities Index returns 23Jul2018 – 27Jul2018. 5. Bloomberg, MSCI World Index returns 02Janl2018 – 27Jul2018. 6. Bloomberg, 10-Year Treasury Rate 27Jul2018. 7. Bloomberg, In this analysis we are making a comparison between the difference of the 2-Year nominal Treasury rates versus the 10-Year nominal Treasury rates using data available as of 27Jul2018. 8. Thomson Reuters. S&P 500 Earnings Dashboard. Retrieved 27Jul2018 from http://lipperalpha.financial.thomsonreuters.com/2018/07/sp-500-17q1-earnings-dashboard/. 9. Bloomberg, Fed Funds Futures Index 27Jul2018. Fed funds futures are used by banks and fixed-income portfolio managers to hedge against fluctuations in the short-term interest rate market. They are also a common tool traders use to take speculative positions on future Federal Reserve monetary policy. 10. Bloomberg, Yield curve is constructed by plotting a sessions final yields for various maturities including 1-month, 3-month, 6-month, 1-year, 2-year, 3-year, 5-year, 7-year, 10-year, 20-year and 30-year maturities. One basis point is equal to 1/100th of 1%, or 0.01%, or 0.0001, and is used to denote the percentage change in a financial instrument.